A safe flat route where you will often find yourself alone with your thoughts. It dissects green agricultural farmland and purple hued bogland offering contrasting and beautiful vistas with the still canal waters a silent companion. In kilometers, what distance is the route? 16kms almost all off road. 6 road crossings in total. What cities, towns or villages are on the route? Do you have a map of the route? Map attached . 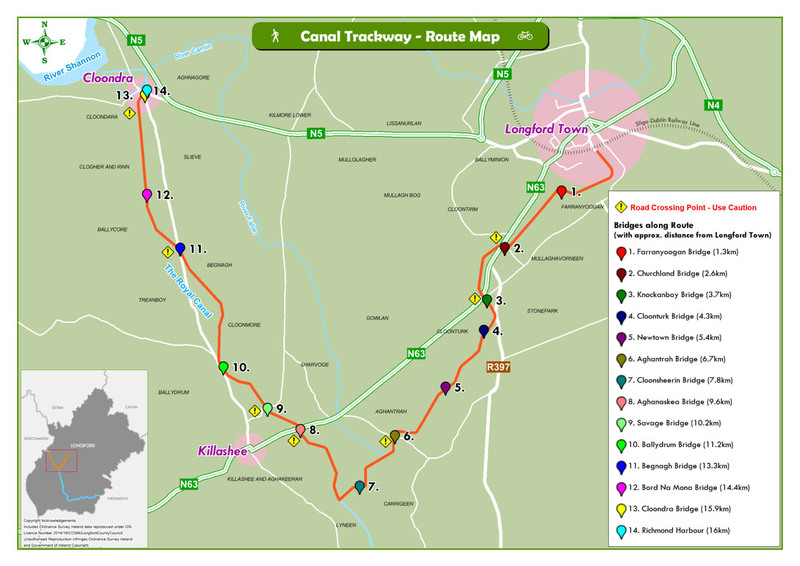 Route runs from Longford Town out Canal Spur towards Killashee and along canal mainline to Clondra harbour. What kind of route is it? Route is built on old towpath that once served the canal. What attractions are along the route? Natural scenery, quite rural landscape, away from all noise except the sound of birds, animals and farm activity. Is off-road section of the route continuous? Are there any sections which users are expected to join the road or dismount? Continuous. Advisable to dismount at 6 road crossings. Particular care should be taken when crossing the N5 at two points in close proximity to each other. Is the route part of any other route or does it connect to any other routes? Part of the Royal Canal trail. Is the route finish or is there any plans to extend it or connect it to other routes? 16 km Longford Clondra route is finished. Are there any public transport links to the route? Are there any companies offering bike hire near the route? Yes , contact Longford Tourist Office on 04333 42577 for further information. If you have used this route and have feedback please comment below or if you’re a council or other body wishing to promote a greenway get in touch by emailing hello@irishcycle.com. Great idea for a series of articles. This is a lovely cycleway. We’ve done it loads of time. Its very handy for visitors as it starts right beside the Longford train station. And the destination is the village of Clondra which is very attractive and has one of the best beer gardens in the country on the banks of the harbour. Great for a sunny day cycle. I have just done the Westmeath greenway which runs from county border with Meath along the canal all the way to the border with Longford and I tried out ( not officially open yet ) the Mullingar to Athlone all Tarmac greenway. As these are linked it must be the longest section of greenway in the country, at least in excess of 100km not including the branches off it like the Lough Owel feeder which is a 6.5km round trip. This greenway network has to be the best kept secret in Ireland.